Richard Bach had said " Children are not our property and they are not ours to control anymore than we were our parents property or theirs to control". Khalil Gibran too expresses these sentiments beautifully. (Click here to read it). I have worked with children for more than 8 years. I used to conduct workshops on developing thinking skills in Children. I used to teach at schools. I have also taught street children. Somehow I have a way with kids, perhaps it is because I really like their company. But that really does not make me an 'expert' as each child is different. There is one thing that I feel every home with a child (by a child I mean those above 3. Till then they are toddlers) MUST have--- a white board and some markers available handy along with a duster or a wipe. Put the whiteboard at a convenient height where the child can reach it and write comfortably on it. Allow the child to do whatever he/she wants on it. Don't be bothered about scribbles, squiggles or whatever he/she does on it. How does it help? Well, it is a very handy tool for expression. To the child, there is no tomorrow or later. It is NOW. If a child wants to draw, a resource is readily available. It is hard to resist a white blank space and markers available readily. It is easier to forget about it when it is tucked away in a drawer which is what happens with paper and crayons. Also, it is neat and does not have to be 'put away' like papers, coloring books, paints and crayons. Ever since my children were little, the white board has always been a part of their room. Both my children wrote so much and drew so much only because of the whiteboard being readily there. It was so much fun! My daughter used to line up all her soft toys and play 'teacher-teacher'--a marvellous way to reinforce what she learnt at school but of course she did not realise that. To her, it was just fun. 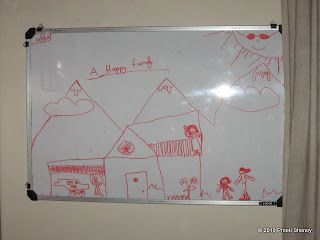 When my children's friends came over, they would love to draw on the board. Learning multiplication tables also became fun on the board as writing on it was so much better than writing in boring notebooks with pencils. The whiteboard did not feel like a chore, it felt like play! So too spellings. Sometime back,she again made this and I again clicked a picture.I am sharing that here as well. My son also uses the whiteboard a lot. Once when I was not well, this is what he had done. Having a whiteboard readily available adds so much fun to daily routines with a child. So I have finally overcome my reluctance and shared one of the things that I do with my children, with all of you. PS: Some of my articles on children and parenting have been published in past issues of Readers Digest Joy. Loved the post. I ain't married but it does look like my parents thought the same way. We didn't have white boards but we had those black boards(the ones you can roll up) and chalk pieces. I was reminded of my childhood - exactly the same games (teacher-teacher) et al. Your kids` creations are indeed cute:) Do write more as my friends & I teach part-time and I'm sure we can use your tips. No offense meant to the people who asked you to write this post but I find it really amazing that people ask tips about parenting. If they can simply look back at what their parents did to bring them up and then probably fine tune it to suit modern day requirements, voila! they'll have an awesome guide to parenting! Coming to the white board idea, I simply loved it! My mom used to run a school in the place where we lived and we had a black board and lots of chalk at our disposal. Atul and Purvi's sketches reminded me of my childhood. PS: Current mood video is brilliant! Lostworld: Thank you :) I do feel a blackboard/whiteboard is very essential. liked the article very much preeti.plz do write the articles regarding parenting.even i used to play teacher teacher game in my childhood.thks for the article. 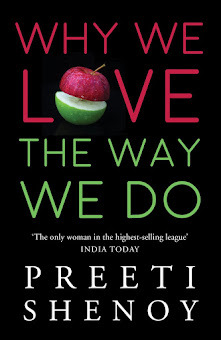 I loved this post very much, Preeti and you are 100% right with the white board role. I have one here for my toddler and she absolutely loves it so much. She never leaves the board blank. She always doodles a cute "smiley face"(that's how she calls it!) every time. Somedays, she improvs by adding shoes, curly hair etc. You are right...it is their little tool for expression. Thanks again for sharing these ideas. I liked your current mood video today. The music and the film is one of my favorite. Also, kudos to the cute work by Atul and Purvi. Have a fantabulous day! This is wonderful piece of advice and i would luv to hear more on this series from you.. Correctly you have said above..there is nothing called perfect parent..and we alway try to find out best for our child...and through your blog post you can help in a gr8 way..
nice post .. u r blessed with very sweet kids .. now,am getting a white board fro myself too !!! Hi Preeti, its nice of you to be sharing ideas like this.. especially when you have so many request mails.. The pictures do tell a tale of ur kids creativity! Even though I dont have kids yet, I have a white+black board combo in my house. It's in our formal living room which is empty right now....and whenever my friends' kids visit (which is very often :)), they are busy out there. I always had one too as a child. I really admire your parenting skills, and I love how devoted and sincere you are to your kids. I hope to learn a lot from these posts and from you. You said it! This post was very different from one of your older posts where you mentioned how we could tell how much time a parent spends with their kids where I felt there could be many reasons as to why a parent cannot. I also agree on a white board coz i have a doodler for my son and i let him draw anything to know what goes in his mind, what fascinates him etc coz he doesnt talk a lot. He is just 18 months :). Good one. Very informative with real good tips on parenting. My kid is just 8 months old however i can definitely keep in mind & follow the advice given as & when needed. I remember as a child i always used to write on all the doors in the house with a chalk or a pencil & if it could not be wiped out, then my parents used to have a tough time getting the door re-painted!!!!!! Ashish: useful right? :) Esp for those idea which suddenly come. Fay: i don't remember in what context I said it. I do feel it is important for parents to spend time with their children. Yeah--a doodler is really a good idea. I must add that each parent thinks they know what is best for their child, but it may really not be what a child wants. (I saw a superb tamil movie yesterday which illustrated this) And whenever I see a well brought up and grounded young adult, I always tke tips from the parents who raised such a marvellous person. Pooja: Even I had not noticed that! I did mention your comment to her and she said she drew that because the sun himself will feel really hot with all his warmth! Rashworld: yes--do see my comment to Fay above. Ayush: Thank you!! I too loved their quilts and duvets :) Am sure you enkoy doodling on your whiteboard. It's an awesome tip Preeti - please keep sharing. Our parents might have done things just right for us but with time, people's values change. The same idea put across to my folks in their time would have been considered an extravagance - in times of budgeting they would feel a slate and chalk would do just as well - white board markers were super expensive back then. While our parents are what we truly want to emulate when raising our children, I'm even they had good friends who gave them a tip or two in raising us. It matters more so when it comes from some one who has worked with and understands children like you do. 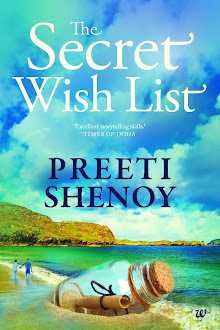 Preeti, I am a mother of two sweet kids aged 13 and 11. Parenting is indeed a challenge in today's world and each child is different and the same parenting rules don't apply to all the kids.Each child is different. Btw even i used to do what you did but instead of white board , I used the blank white sheets of calender backs and other cardboards which were used in place of board. Loved your writing and share your thoughts. hope to be a regular at your blogs. keep the good work going. Asha: Welcome to my blog and thank you for commenting..yes charts/calendar backs etc also work the same way. :)And you are of course very right about parenting. Madhumita: My son is also very fond of origami! He learnt it himself---it's one thing I can't do! Excellent idea! loved the post and of course we want more!! This post reminded me of my childhood. My mom works in a college & our our home (staff quarters) was a old classroom of college & for some reason they retained the huge black board. I was so thrilled to have it..:) I too played teacher..
Hi ! It's me...I'm so sorry not to have visited for so long. Yes, there is an opinion for each parent. When my Eldest son was born, I was given a book called 'A Good Enough Dad' by Nigel Planner. It taught me that you don't have to strive to be a parfect parent, you only need to be good enough.The second lesson I learnt was relating to the quote here in your post, that we do not own our children...they are not possessions.We are guide to bring them to a place of independence. I think you are doing a great job with your two..they are incredibly fortunate to have such brilliant parents!! 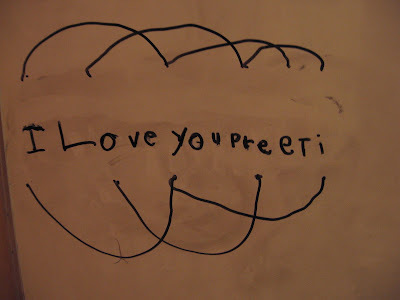 Preeti, I think my dad and you will get along well. We had(have) the exact same whiteboard with us. Always did. They were replaced with newer ones, but as long as I can remember, my parents always had a white board for us. great post! i would like to c more of this kinda post! Even v had a black board at home! Used to be fun! The person who commented in Mandarin: I have no idea what you said :P I wish I did. If someone can tell me how to translate the comment that appears here please enlighten. Wannabewriter: Soooo cute! Did u click a pic? Shaily: :) You remember how we used to discuss Glen Doman? That Pondicherry school really helped. Niall Young: Oh --your three are too! Your sons are such fine young men and annie is a delight! The book sounds good. Hey preeti, I read the chinese comment and googled it ..
Life is like riding a bicycle, you don't fall off unless you stop pedaling - Claude Pepper! I used to have a slate and chalk too at home. And would at times go to my Dad's office in the afternoons too. His lab had a full classroom size blackboard. I would have to stand on a lab stool to be able to reach up to write/draw. Didn't realize up till now how useful it might have been. Right on! I am always open to tips and luv mama tales of all mammas but just that I dont force anything on my son atleast not now:). Btw belated congratulations for "National Best Seller" nomination. I also liked Satish's post but somehow the comments never went through then. Thank God there wasn't a condition as such that only 'parents' could comment, coz I wouldn't have been able to resist! P.S: Such a cool post, seriously! I really wished I had that white board while growing up. I mean it! Sparkling: :-) Oh--even I wished I had a blackboard/whiteboard while growing up :) I think it is me on the balcony she has drawn :) Her dad is in the garage near the car and she and her bro are outside :)Yeah, atul does all kinds of writing. Anusha: Thanks so much! how does one gogole from comments page? U have to copy paste right? and then do page translation--or is there any other way? I love this post. I would love to extend it to adults too. There is no better way to illustrate ideas or brainstorm than with a whiteboard. The erasability helps to put down all the thoughts to make them into a coherent piece. sruoloc: yes--you said it well! Wonderful idea Preethi! I am going to incorporate this soon in my house. Do keep up with the series! Will look forward to it. Do you want the site's link? First time here..liked ur post :)its kinda reaffirmation of what i was thinking.. I 've been contemplating getting a chalkboard/black board... but whiteboard seems to be a better idea..
My daughter is always drawing on all available papers.. [earlier it was walls].. and it takes some effort to put away the stuff and preserve some of her drawings. I guess a whiteboard would be very convenient! !